Well that was a little disappointing, we made the long way down to London last weekend for the twice yearly Comiket Comic Fair show as part of the ongoing Comica Festival and well it was slow, very slow making for a long day, made worse by various train delays on the return journey meaning that I didn't get home till well past midnight,when of course I turn into a pumpkin - not recommended at Hallowe'en time! On the upside we met up with Gary Crutchley, stalwart artist on Accent UK's WesternNoir series, on arrival at Euston who joined us at the show. Its always good fun catching up with Gary and his infectious enthusiasm for comics in general and the WesternNoir series in particular and, with Dave, I was delighted to see a preview of Book 4's art which is almost complete and promises some real surprises. 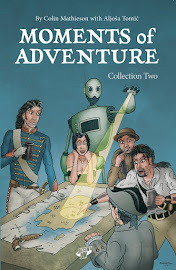 Book 3 has just had another great review here and Book 4 should be ready to make its splash around March next year when the new convention season gets underway, until then sorry you'll have to wait! Back to Comica and this was the second show at Central St Martins College just behind Kings Cross Station London following the one back in April where although there was clearly some signage problems that show was a resounding success, being our best ever showing at Comiket. We therefore had high hopes for this one and despite again having signage problems and a change in the interior layout we weren't unduly worried by the slow start as things had picked up last time, however the 'kick' never came and things remained very slow throughout the long day to its 7pm finish. In the end we sold less than 1/2 what we had in April and although covering table costs we were well short of covering our travel costs down. Everyone we talked to had a similar slow day but it was difficult to pinpoint why as the show had its usual talented guests bravely undertaking the on stage live drawing parade and eclectic mix of exhibitors but despite being free to enter it didn't have the attendance we'd experienced last time. Maybe a lot of students hadn't returned from half-term (do College students get 'half-term'?) 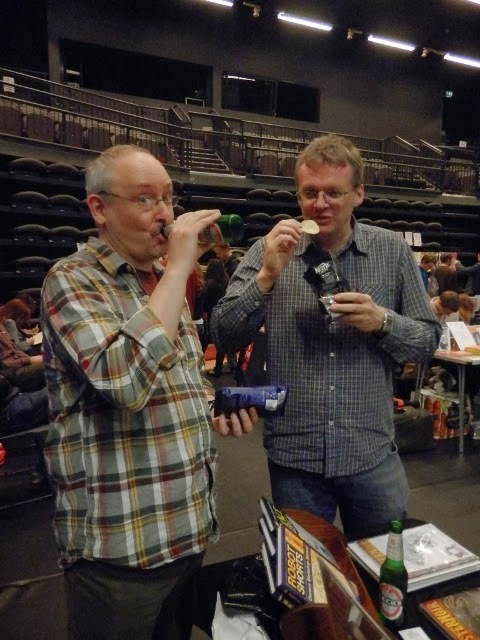 or maybe it was a wider comic show fatigue, certainly the calendar is far more crowded than ever before and much of the exhibitor's talk was about the recent success of both The Lakes and last weekend's London MCM show where apparently 88,000 folk attended! 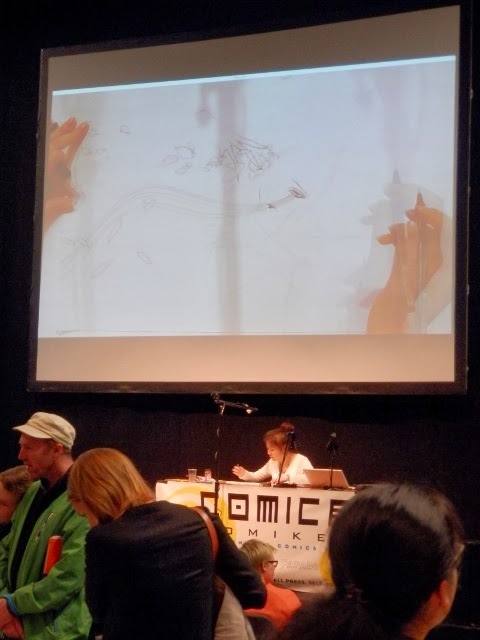 Whatever the spectre of other shows, Comiket remains unique in its eclectic mix, celebration and optimism of the comics medium and is a really friendly show with a pretty decent soundtrack too, so we really hope this was a one-off blip. In any case there were exciting plans announced for 2014 with Comiket's Spring outing likely moving to May or June to coincide with a new exhibition of British Comic Art which Paul Gravett (and I think John Dunning) are curating at the British Library with it planned that the Comic fair will also take place at the library!! The full Joe Sacco Great War panoramic 'tapestry' at full length! That exciting news and the great time we had in catching up with many good friends and familiar faces of the UK comic scene - including the recently returned world traveller and friend of Accent UK Cliodhna Lyons (and a host of others that there isn't enough room to cover), that and as always the glimpse of one or two potential interesting new projects, made the trip to London and Comica worthwhile - phew! Yep, an honest account of the day Colin. Good enjoyable fun, just a shame we didn't finish it off with great sales. Still, I'm looking forward to the next one. Thanks Dave and thanks for your company too on the epic journey home - the thing swe do for comics huh! Great choice Keir, its really interesting, lots of detail and should provoke discussion in the classroom.